The granite countertop and the backsplash will be the focal point of your Toronto kitchen design. Get it right and you will achieve bragging rights in the neighbourhood. Get it wrong and it will be a criminal waste of time, effort and a significant amount of money. Selecting the right countertop colour and design is half the battle won. How do you win the other half? Here are 5 ideas to create a visually stunning backsplash that complements the countertop and accentuates the kitchen décor. Unless you have chosen a solid colour for your granite countertop, granite has an abundance of natural colours in the form of veins, flecks and patterns. The backsplash is the best place to echo these colours to create a stunning visual focal point. In most cases, the primary colour of the granite is neutral while the patterns are bold. You can either use bold coloured tiles or even use a mosaic of all the bold colours in your countertop. If it’s the other way round, then you can use neutral tones for the backsplash and create an attractive contrast. Either way, it’s a winner. 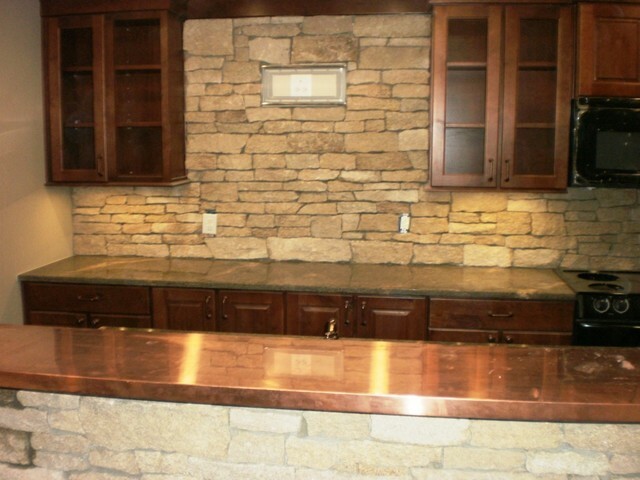 One of the hallmarks of granite countertops is that it blends easily with a wide range of stones. This allows you to play around with your backsplash design. You can choose from slate, limestone or marble. If you have opted for a contemporary design and have a neutral granite countertop, then pair it with marble subway tiles for a clean but stylish design that offsets the countertop. If your granite countertop is glossy polished, then you can choose a backsplash with a matte finish or made of rough stone. Adding some texture to the backsplash creates a balance in the design and prevents the décor from looking overwhelming. On the other hand, if you have chosen honed granite, then you can add some shine on the backsplash. One of the options is to use glass tiles. Granite countertops act as the perfect neutral base that can readily accept bright colours. And this allows you to make the backsplash a spectrum of colours without the risk of making the décor look over the top. Be it glass or ceramic, opt for vibrant coloured tiles. You can also play around with the pattern. Since granite has an array of irregular patterns, you can contrast it with a structured backsplash that reflects geometric patterns. You can accentuate the look of the granite countertop and the backsplash with under cabinet lighting. However, when it comes to tiles, you have to be really careful while selecting the lights because if the surface is slightly uneven, then the light may make it amplified. There are various types of lights to choose from. Ensure that you view the granite countertop and the backsplash under different types of lights before you make a choice. With the right backsplash and granite countertop, your Toronto kitchen design will never look dated even after a few years. So take time and make the right choices.